So guess what? Our seniors caught the event bug. 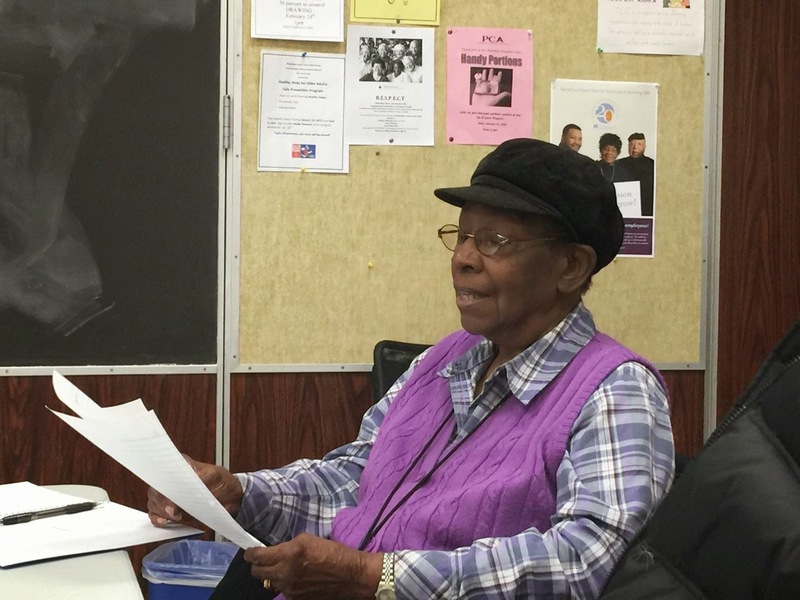 We had so much fun at our Black History Month event last month that we are planning a followup event for Older Americans Month on Thursday May 7th. Details to come soon but we will be signing copies of our storybook (which you can preview here) too! One great question my senior buds brought up is, what stories are we going to focus on this time? It’s silly to just talk about being old; what we really want to show people is that being old is not one thing, but many, many diverse things, things from long, long way, and things from today, and diverse opinions on those things. As I looked through their recent stories to draw some inspiration, I came across Loretta’s stories below, and I realized maybe the “theme” could be this: “Memories from the Past, Wisdom for the Present.” What do you guys think? This Thursday when I see my buds again, we will spending some time to plan out our event. I will let you know what we come up with! I learned at an early age you work for what you want and need. In order to help out I would after school scrub steps and earn 25 cents. There was a couple from Germany struggling to learn English. I would for three days after school spend time teaching and tutoring them for $1.00 an hour plus they would give me a banana sandwich on buttered rye bread. Ground beef was not expensive about $1.50 a lb. Long grain rice was 10 cents a lb. I would buy dinner about two nights a week. My mom and dad were proud of me for helping out. My older sister married and my older brother were in the service. It was no problem helping younger sister and brother with homework and assigning chores. There were 10 of us and we were very close. Because of the responsibility patterns we grew up and it was easily transferred to our adult life. Some of our younger relatives haven’t quite seen in our way yet, but we’re hoping. When you work for something needed or wanted there is a sense of joy and pride. It might be something you cherish and plan to keep or it could be a gift for someone special. When you earn is it’s a keepsake in your heart. You would be surprised by how much you can learn by being a listener. Well, I hope you were listening. There is so much offered for Seniors. We have better access to enjoy more activities. So, forget about us just sitting in a rocker or watching T.V. all day. We are very active. We have planes to go, things to do, people of all walks of life to see and meet. Or the Phila Senior Center the main branch; the staff are helpful and informative. There’s computer class, digital photography + more. There is always something going on. We have various levels of exercises. T’ai chi is smooth and improves balance. In Silver Sneakers classes we do things with hand weights, small balls and ropes that will tighten our biceps. Jewelry making is colorful and charming. There are multiple types of serious card games. Watching the domino players is very very interesting. The checkers and chess players are very intelligent; you may watch, but be quiet. There are boxes and boxes of jigsaw puzzles. Want to learn another language? We can participate in French, Italian or Spanish. Trips to the Casino and other interesting places are so exciting. We have access to social services four our personal needs. They can and do answer medicine questions concerning prescriptions. Bible study, which is relaxing and informative. The meals have been planned to meet our nutritional needs. There is so much to enjoy as we gather together and share our spirits and life styles. I have learned about the writing class “The Best Day of My Life So Far.” I am really enjoying the opportunity to write about life as I have lived and seen it. It is so nice to hear the thoughts and ideas and experiences of others. The volunteers here are friendly and always ask, “Are you alright?” The good ol’ days, some were then, some are occurring right now. So don’t count us out. We are very much active and in the running. Well, got to run. Meet you in the gym.